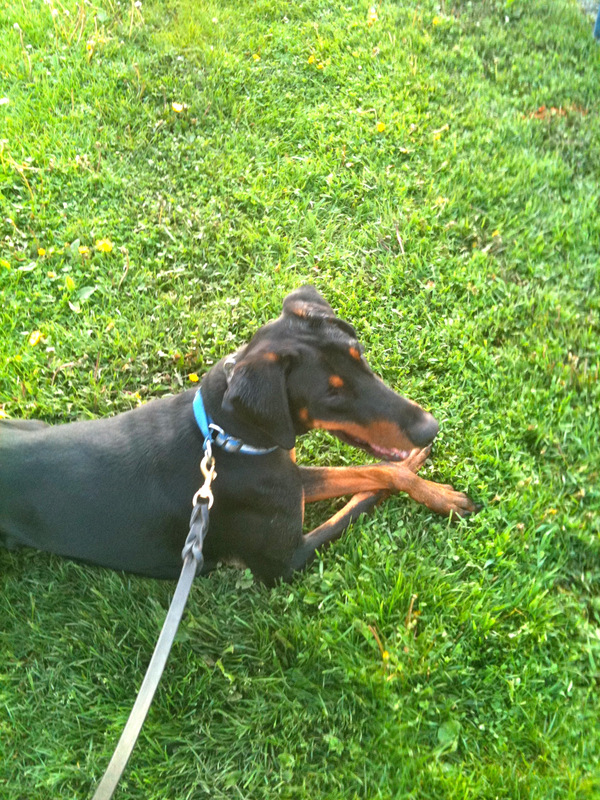 Spencer – Excited Doberman to the Max! Spencer, a high energy Doberman came to Michael Burkey’s Michigan Dog Trainer board and train dog training program because it was impossible for his owner to walk him in public and while a very sweet boy; he was extremely difficult to live with in a home. He chased cars, lunged with over the top excitement toward strangers he met on walks, had no clue how to walk on a leash, and picked up every item on the ground (paper, cigarette butts, etc.) He even tried to pick up a piece of flat tape that was affixed to the ground. He was a challenge and a joy to work with because of his excitement level. Spencer learned to walk on a loose leash, not to chase cars/bikers/joggers, not to jump on strangers, come when called, to leave it, to give and to walk with other dogs during group socialization dog walks. This entry was posted in Testimonials & Case Reviews, Uncategorized and tagged board and train, Doberman Pinscher, dog, dog behavior, dog training, dog walking, e-collar, ecollar, electronic collar, loose leash walking, michael burkey, Michigan, Michigan Dog Trainer, Pet, private dog training, professional dog trainer, professional dog training, puppy, puppy obedience, remote collar, remote collar training, remote collars, remote training collar, shock collar, shock collar training, shock collars, Training. Bookmark the permalink.